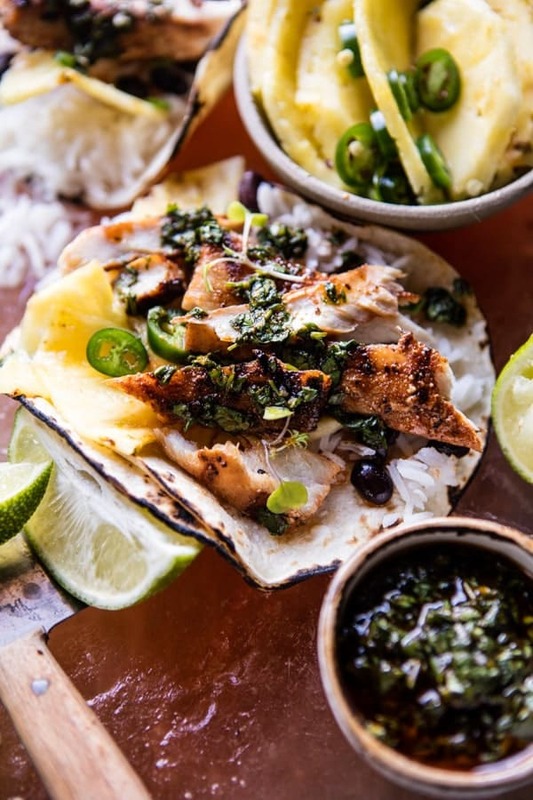 Spicy Fish Tacos with Tequila Lime Pickled Pineapple. Happy Taco Thursday!! Yes, yes, Taco Thursday! Because, I mean, why the heck not? With Cinco de Mayo only a week from tomorrow, I’m basically bombarding you guys with all my favorite Mexican inspired recipes. I really hope you don’t mind…I am personally loving it. 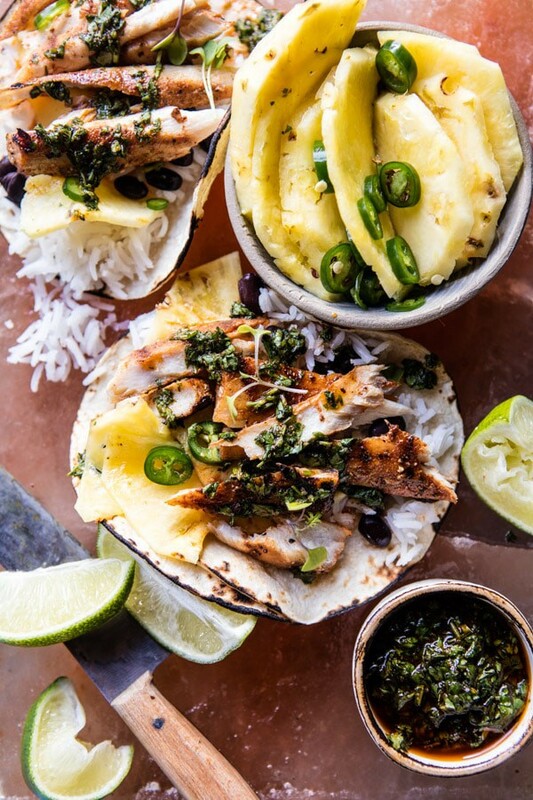 Cheesy Chicken, Lemongrass Guacamole, Breakfast Tacos (these are SO good), Cauliflower Rice Carne Asada Bowls, Lemony Lime Mango Mezcal Breeze, and now these fun, tropical fish tacos! As you can tell, I’m kind of excited about these tacos. For one, they are so very fun…hello tequila lime pineapple?!? <–totally love this. Two, they are so easy to prepare and pretty dang healthy. <–hello to heart healthy grilled fish, protein filled black beans, and fresh pineapple. Three, they are so good. <—I mean, obviously. Four, they’re going to instantly put you in a good mood. <–seriously. Ok, but you guys, in all seriousness, these tacos are delish, and they really do put you in a good mood. I actually ended up making these on Tuesday for dinner after a long, long, long and honestly not that awesome day. It was just such an off day for me. Nothing was clicking, nothing was working, and everything was frustrating. I get it, it happens, everyone has off days, but man, they are really not my favorite. It didn’t help that I’ve been dealing with some kind of weird bug for the last two weeks, which I do think is thankfully starting to go away. SO, the only logical thing to do after a just plain crappy day? 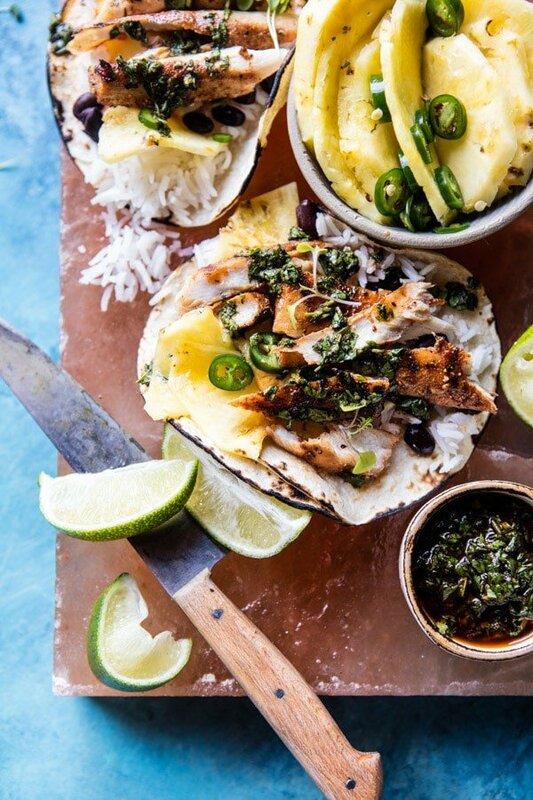 Make tropical fish tacos and pretend to have your own little fiesta right at home. Not quite the same as being on the beach in Mexico, but on any old weeknight, I’ll take it! Now let me explain these tacos. These are a mix of Jamaican jerk meets Mexican…meets Moroccan. Wait, what? 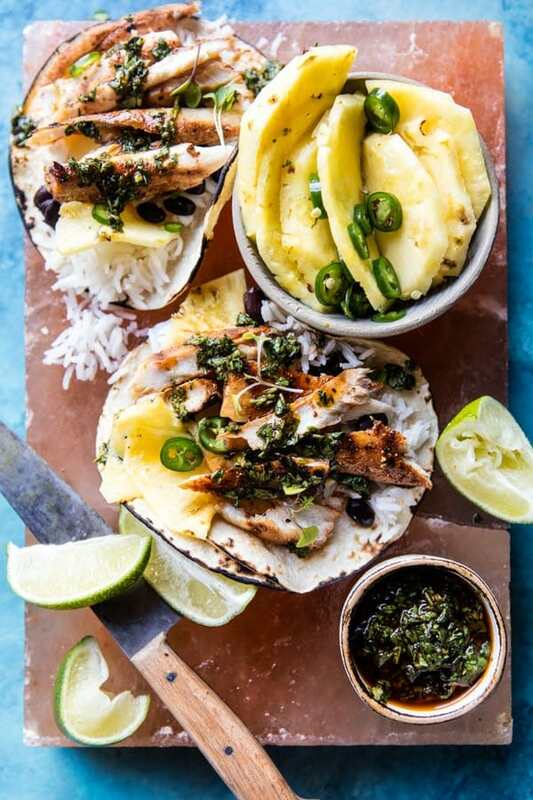 The fish is a mix of Jamaican and Mexican flavors, while that tequila lime pineapple is all Mexican, and the Chermoula sauce? Well that’s where the hit of Moroccan flare comes in! Chermoula is a sauce made of fresh herbs, garlic, and spices that’s commonly served over grilled meats and fish. My brother Creighton was telling me about it a few weeks ago and I knew as soon as I looked it up that it needed to be served over fish tacos. So that is just what I did! I know that the ingredient list for these tacos looks just slightly scary, but I promise everything comes together so quickly. 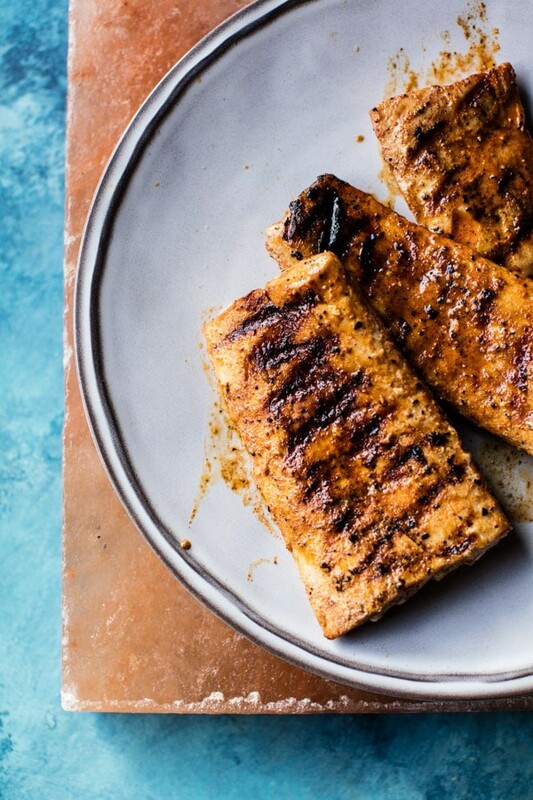 The fish gets tossed in a simple marinade and then grilled. The pineapple needs a few minutes to sit in the tequila, but other than that, it’s ready to go in just minutes, and everything for the sauce goes into one blender. Then assemble and DONE. If you aren’t up for taking the time to make the sauce, that’s totally fine. 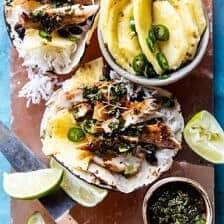 Of course I love the tacos best WITH the chermoula sauce, but there are plenty of flavors going on in the fish and pineapple…the sauce is just an extra touch! I like to serve up my tacos with steamed rice (surprise, surprise) and black beans. You could of course add some fresh avocado as well. I would have added avocado to mine, but if I’m being honest, I just could not get them into my tacos…too much going on! Trust me though, the avocado was added after photos were taken. I just can’t do tacos without avocado. OK. 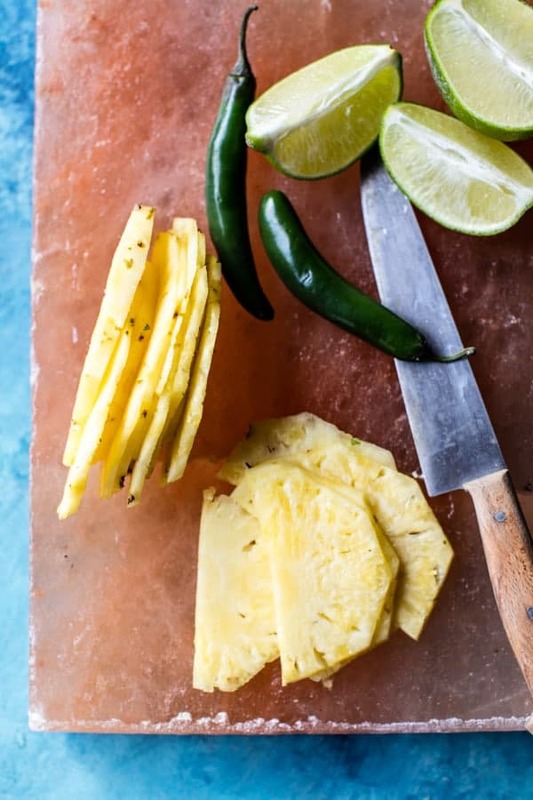 But real quick, can we take a second to talk about that tequila lime pineapple? It’s possibly my new favorite taco topping. It’s simply fresh pineapple, thinly sliced, with lots of lime, and a dash of tequila. It tastes like a pineapple margarita, just less sugary. And you guys…it is addicting! The longer the pineapple sits in the tequila, the more flavor it will soak up. I let mine sit thirty minutes, but you can go up to overnight (store in the fridge). Also…can you imagine how good this pineapple would be in an actual margarita!?! Trying this for sure. All that said, if you’re not a tequila drinker, you can just omit it and make lime infused pineapple. It’s still going to be delish…as pineapple always is. Maybe it’s time to plan a taco night? Maybe tonight? Over the weekend? Next week for Cinco de Mayo? Either way, just be sure to make these tacos soon. They are too good not to be eaten on a regular basis…honest. 1. In a 9x13 inch baking dish, combine the orange juice, honey, all-spice, paprika, cayenne, salt and pepper. Add the fish and toss to coat. Let sit in the marinade for 10 minutes. 2. Heat a grill, grill pan, or skillet to high. 3. Cook the fish for 3-4 minutes per side, or until cooked through, drizzling the marinade over the fish, as it cooks. 4. To assemble, divide the rice among warmed tortillas. Add the black beans, and pineapple. Add the grilled fish and serve drizzled with the Chermoula Sauce. EAT. 1. Add the pineapple and jalapeño to a shallow bowl and pour over the lime juice and tequila. Let sit 20-30 minutes or up to overnight. Serve alongside the tacos. 1. Add all ingredients in a blender and pulse until combined. Taste and add salt as needed. Serve drizzled over the tacos. And lastly? Tomorrow is FriYAY. Whoop. Whoop. 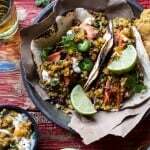 Jamaican Jerk Fish Tacos with Plantain Fried Rice and Pineapple Salsa. 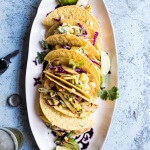 Seafood Tacos with Lime-Green Chile Sauce + Grilled Corn Slaw. 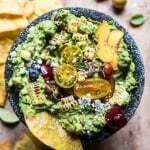 Let’s Have a Fiesta: My Favorite Cinco de Mayo Recipes! 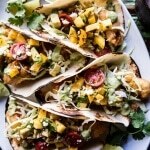 Baja Fish Tacos with Chipotle Mango Salsa. I always wish there was an alternative second tasty sauce for those who dislike cilantro. That would be really nice! Hmm..
I’m all over Mexican flavors right now too Tieghan…and always, who am I kidding? But seriously, with Cinco de Mayo being my favorite holiday, there are never too many Mexican recipes floating around 😀 I can’t wait to spend pretty much the next week getting ready to celebrate! Days when nothing clicks are the worst…I hope things are looking up! It really is the best holiday, especially for food!! I love it! Can;t wait to see all the delicious recipes! Thanks Lindsay! Yes!! I love them, thanks Allyson! I love pineapple – freshly cut, especially grilled, but oh my goodness…pickled. Clever! And the ingredients – I will not leave out the tequila! Beautiful taco recipe! Can’t wait to make! Right! The pickled is so yummy! Hope you love them Deb! Thanks! Haha yes me too! Thanks Heather! Hey Carol! Thank you so much! You are making me smile ear to ear!! I have never made corn tortillas. I just buy the brand at my local grocery store. Here is a link to the photo. Hope that helps and thank you again! Sorry, but I’ll be happier when May 6 arrives. Oh. Em. Gee. Tequila lime pickled pineapple! YES to everything Cinco de Mayo! Haha, recreational shopping! I love it. Thanks Christine! Yes, its so delicious! Thanks Laura!! Oh my word! You had me at “tequila lime pickled pineapple”!!!!! No need to write anything else! 😉 I think this is what’s for dinner tonight! Haha YES!! hope you love it! Hi Tieghan ! Just wanted to say hi. I made this recipe yesterday (fish cooked on the bbq mmhh) and it turned out so well !! Everybody was pleased, thanks for your good work on this blog, I love it ! Wow, hi Carole!! SO excited to hear from you! Sounds like so much fun and i’m so happy it was good, thanks so much for making it! These are delicious! Made them last night with grilled cod. The pineapple is amazing on its own, literally so good! Thanks Tieghan!